An expansion pack is a funny thing. Much of the time, it simply consists of new maps, new monsters to kill (or cities to destroy -- take your pick) and new means to do so. However, some expansion packs seem to set the goal of immersing the player in a new story, where the more simplistic add-ons are simply a bonus and the focus lies in developing something more “magical”. On a few rare occasions, that “extra something” is what keeps us awake ’til dawn – despite having to go to work or school – thinking “I’ll just go beyond the next corner and see what’s there, then I’ll go to bed”. The exact reason this occurs is always hard to put a finger on, but whatever it is, it is special to each game. It is joyous to find that this is the kind of expansion that was released for Neverwinter Nights 2. As with all self-respecting expansion packs, the protagonist in Mask of the Betrayer wakes up where the original game left off. Excruciating pain? Definitely. Alone? Most certainly. No idea of what has happened whatsoever? You bet. Nothing out of the ordinary here, but as the game continues, the player is treated to one of the better stories in recent years. It is impossible to describe anything else without spoiling the story. As noted earlier, the game is merely an expansion and, as expected, not much has changed in the interface. However, a new camera angle has been added that allows for a more real-time strategy (RTS) styled gameplay. 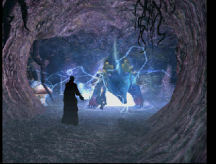 In this camera mode, the player is able to zoom out and choose the characters as “units”, including whom to attack and so forth. A very useful feature in messy battles (and there will be lots of those!). 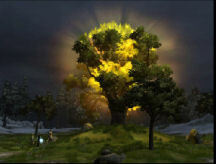 There are also new races and classes, as well as a new armory of weapons, armours and magical items. No surprises there. The real difference in the expansion pack (compared to the original game) is how everything is driven forward. Or rather, not so much how, but the depth of it. 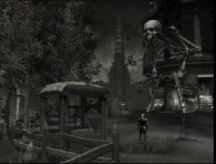 Both the original game and Mask of the Betrayer use extensive cutscenes and many lines of well-voiced dialogue to propel the story. Granted, Neverwinter Nights 2 had an astounding amount of dialogue when compared to most role-playing games (RPGs ) these days. But it was there, much of the time, to let the player know what he or she was to do next, and to give the world a more vivid personality. While this worked, there was rarely any deeper context to it, and that is where Mask of the Betrayer differs from the original game. It’s hard to explain it, but let’s just say that Mask of the Betrayer is to Neverwinter Nights 2 what Planescape: Torment was to RPGs in general. It does not contain the same masterly as-good-as-in-a-book story as in that classic RPG, but it’s certainly well on its way. Love, defiance and loyalty are mixed with despair, futility, sorrow and melancholy to create one of the more humbling and depressing games developed in this genre. It is without question the top achievement of the Neverwinter Nights franchise. The graphics engine may be slightly dated, but it still delivers crisp and clean graphics. In the usual manner, fireballs sizzle, magics are cast, and torches throw their light around old tombs while projecting shadows on the walls. 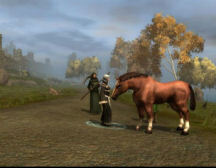 One could call the graphics “simple, but effective”, since their rather dated quality does not take anything away from the gameplay. As for the sounds department -- which is always a crucial factor in any game of this kind -- we are not disappointed. With the battle sounds -- the insanely annoying “huaargh!” (heard for the tenth time in a minute) or: “Now see what a true warrior looks like”, one begins to wish for a more diverse vocabulary, or at least some kind of amusing line. (Something akin to the responses given in the Baldur’s Gate games when characters get tired of being clicked on). Apart from that, gamers are not going to be left clutching their bleeding ears from playing Mask of the Betrayer. This can mostly be attributed to two things: the music and voice acting. Yes, the ambient sounds of a city or the droning sounds of the Shadow Plane really add to the atmosphere. But it is the dialogue that makes the game, and the voice acting that makes half the dialogue. For once, it sounds as if the actors have truly become their characters, not just voiced them. Great attention has been paid to matching the actors’ voices to their characters’ personalities (the cynical, the calm, the determined, and so forth). And what about the music? As always, the music is ever-present, sometimes more, sometimes less, but always there to provide the mood. These elements in combination create a really effective atmosphere for the game. For instance, being in the Shadow Plane is quite frightening. Imagine the usual world and then twist it to a darker version while muddling all sounds made within it. Then imagine the air almost too thick to breathe, your movements sluggish and your senses reduced to a minimum. Of course, there’s no possible way that the game engine can simulate all these sensations, but that is the feeling that is conveyed by the game. While the Shadow Plane is a spectacular example, the atmosphere is abundant in almost everyplace in the game, be it marshes, mountains or wintery landscapes. But what would the world be without companions to explore it? Well-fleshed-out and charismatic non-player characters (NPCs) are what we (at least, what I) expect and hope for in an RPG, and that is what we get in this expansion pack. But this time around, the characters are much more involved with the game than with their own personal train of emotional baggage. Personal reflections, stories and relationships are woven nicely into the main story. Remember that (sometimes giddy) joy of having opened up new dialogue conversation choices (either by influence-checks or because they are story-related)? The only thing that is slightly irksome is that we were promised that we would be “meeting up with old friends”. Understandably, with limited resources, a packed schedule and new NPCs, it’s hard to come up with new material for old characters. But meeting just one familiar face and then, through him, being told what happened to the others? Somewhat disappointing. Even the sun has its spots, as the saying goes, and these cannot be ignored. The first is a matter of personal preference, but for me it had a tremendously negative impact on the gameplay. Anyone who has played very early RPGs will remember games that were almost like a simulator of daily routine. You eat and sleep. Oops! You haven’t had an apple all day. You die. Game over. That kind of thing is back with a vengeance in Mask of the Betrayer, but in disguise. Explaining more without divulging the story is impossible, but I found this feature to have absolutely no redeeming quality whatsoever. It is annoying, frustrating, stressful and adds nothing to the gameplay. It would also have been nice to have had more side-quests. Unfortunately, the game is much too streamlined, almost as much as the original. Side-quests do exist of course, but they are few and far between. There are – as mentioned above – some extremely frustrating aspects of the game, but despite being a big part of the game, they do not diminish the rich story, depth and pure enjoyment to be experienced. All in all, Obsidian has managed to compile an expansion pack that combines everything we love about RPGs into one package, doused in sweet melancholy. And when we are lapping up the final drops, we are left with a bittersweet taste. This expansion is what Hordes of the Underdark was to Neverwinter Nights, but even better.